Home improvement store Lowe’s is employing human-sized robot shopping assistants this holiday season, which can respond to customers’ questions, scan products using a 3D camera and help them find items in-store. Predictably, “Last Week Tonight” host John Oliver is not so convinced. YouTube/Last Week Tonight With John OliverJohn Oliver thinks Lowe’s robot shopping assistants are ridiculous. 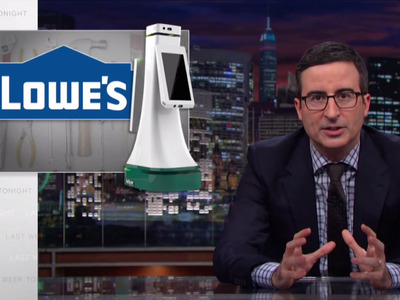 Home improvement stores are “a lethal combination of everything that can ruin a relationship: spending money, reconciling tastes, long-term planning and fluorescent lighting,” Oliver joked. He then went on to introduce a dummy ad for rival Home Depot, spelling out exactly how a home improvement store should market their helpful sales assistants: basically as marriage guidance counsellors that interject arguments with suggestions on patio furniture or bamboo flooring.